Garlic chili oil is a perfect combination of hotness and aroma of toasted garlic to season your Dhal and other exotic dishes. This one is best to prepare without the young Sous Chef, just for safety. Peel and chop garlic gloves with knife. Pour the oil to a small saucepan or pot and heat the stove to maximum. Add chili flakes, chopped garlic and salt. Fry until sizzling and stir with a spatula or spoon continuously. When the garlic is golden but not yet brown, turn off the stove and pour the mixture to room temperature pot or bowl in order to prevent the garlic from overcooking or even burning. 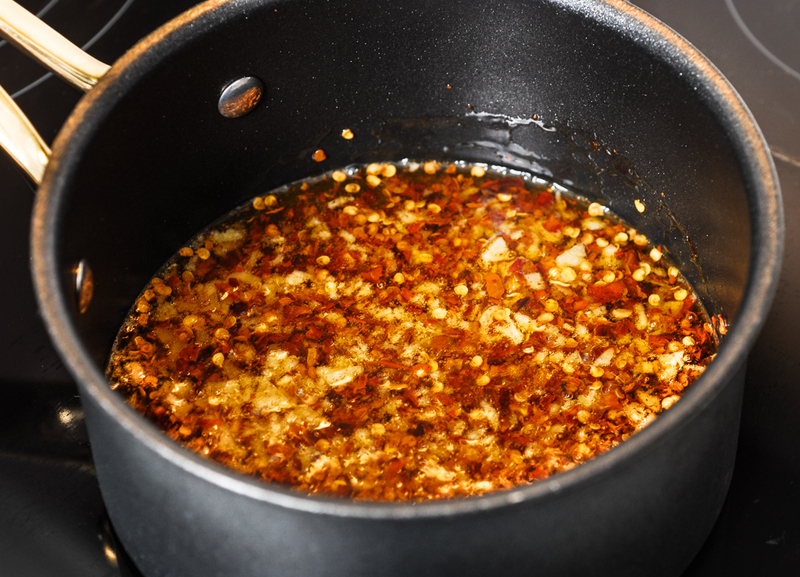 You can store Garlic chili oil in the refrigerator about a week.